After a three-year recess for repairs, the State Gallery of Armenia has reopened, renewed by some $450,000 makeover sponsored by the Lincy Foundation. The State Gallery is open again after three years..
Government officials and art and culture personalities greeted the refurbished gallery in opening ceremonies on May 18. Gallery director Paravon Mirzoyan said the 83-year old gallery follows only Moscow and St. Petersburg in terms of value among galleries of the former Soviet Union. “The Gallery is a road for showing and demonstrating our uniqueness and originality to the world,” said Prime Minister Andranik Margaryan. The gallery had never been refurbished since it opened in 1921 and art lovers were concerned, not just for the condition of the building (which anchors Republic Square), but for the artifacts it holds. Now, from basement to roof, repairs have been made. Some windows were removed and covered over, increasing display space, but also protecting paintings from harsh sunlight. Additions to the gallery include a gift shop on the second floor, and a café on the ninth. The National Gallery, founded on the efforts of Ruben Drambyan and Martiros Saryan, is home to more than 25,000 works. The Armenian section of the gallery includes sixth and seventh century murals, sculptures and religious icons as well as works of 19 th- and 20 th-century artists. 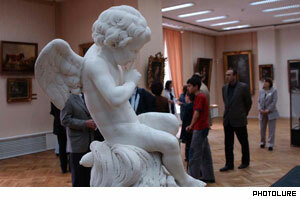 Foreign sections include painting by Chagal, Rembrandt, Van Gogh and others. While construction workers were busy making repairs, National Gallery scientific and research staff were also busy, publishing 12 albums and calendars of collections found in the gallery.